No other issues- patient appeared to be robust and healthy. ACB x 3: Mild Hypothermia- 34 degrees C..
Prime volume estimated at 1000 cc’s. Antegrade Cardioplegia for onset and continuation of myocardial preservation. Note that CO2 is in the high 80’s. Surgeon notified that I need to come off CPB- because we aren’t saturating the patient. Surgeon makes comment about the color of the arterial blood. Anesthesia resumes ventilation, I fill the patient, BP- 140/80 and come off bypass. Pt Temp approx 35.5 degrees C.
Pt isn’t cooled yet- no XC yet- so heart is beating, I inform surgeon I am coming off to evaluate the ECC- shunt blood back to the patient, Anesthesia resumes ventilating and we come off bypass with normal ejection and pressures. Verify that O2 line is attached to Oxygenator. Check O2 sat Monitor- which indicates 100% O2 coming from the gas lines. PO2’s still too low- on for about 45 seconds- and off again. Ask assistance from anesthesia- Dr. Jack S – to help me double check my circuit (especially the O2Delivery component) just to make sure I haven’t missed anything. I re-rout my blood Q through the recirc line- to see if the blood oxygenates at all- it doe pink up a bit. Dr Shannon and I do a series of manual tests- removing the O2 line from the Oxygenator to make sure that gas is indeed flowing through it. We both confirm that it does. 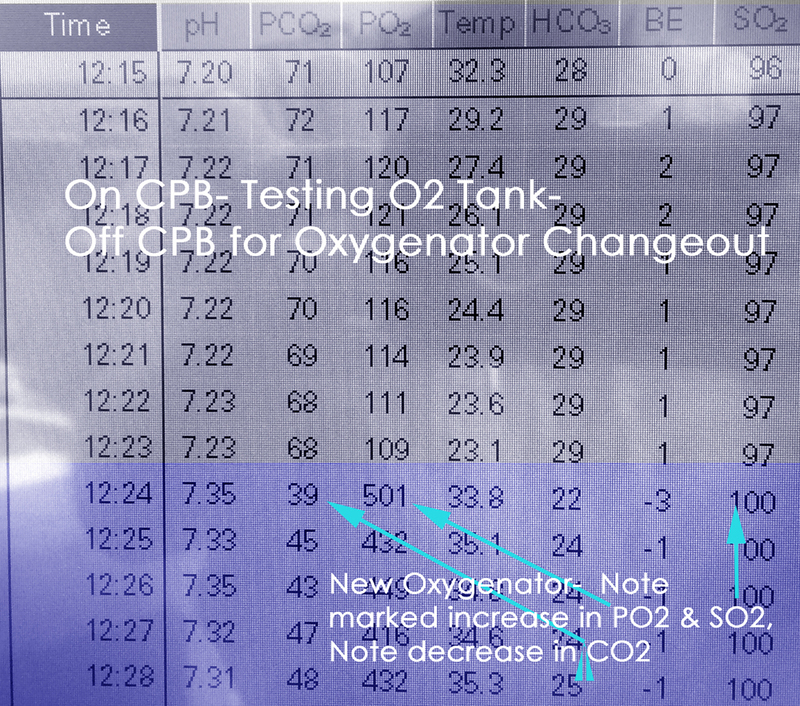 Since the blood did “pink up” when recirculating it through the Oxygenator- it verifies at least some functionality- so I try CPB again. To rule out a massive failure in our room O2 delivery system- I change the source to an external oxygen tank @ 100% and 5 LPM. Decision is made to change out the oxygenator. Visual confirmation from surgical staff at the table that there is no air in the arterial line. PCO2 drops to normal limits. Aortic Crossclamp is placed on the aorta, heart is arrested, and the operation proceeds with no further incident. Chief Perfusionist, is notified and comes in to assist and evaluate. CMC Risk Management is notified and takes possession of the failed oxygenator. Manufacturer confirms that: there was a structural damage issue- not involving the membrane itself, that rendered the oxygenator useless. This is a new platform for Quality Improvement. We are trying to develop a database of common or not-so-common problems encountered by perfusionists during CPB. We are inviting perfusionists, groups, and institutional participation to develop a universal platform for identifying areas of concern in terms of Quality issues or trends encountered by perfusionists around the globe. Please join us by clicking the Link Here. If you have had an unusual event you would like to share. Click this link. My goal is to get 500 participants- American, Asian, European, all countries are invited. In the process we shall develop an email contact list so that we can come to a consensus for how to design a universal CQI reporting platform. Once that is established, I believe we will be the tip of the spear for perfusion quality improvement. At least take a look at it and see what you think. It’s easy, non-time consuming, a valuable CQI initiative, and TOTALLY anonymous. 4000 ECC, luckly no mishaps. Only one problem, with a y-connector on an ECMO. Try to change tubings with an patient That’s awake. Creepy, but, we managed.